This week #BlackLivesMatter turned 5. Catholics must continue to embrace its mission. On July 13, 2013, following the acquittal of the neighborhood watch volunteer George Zimmerman, a year after he fatally shot an unarmed black teenager named Trayvon Martin, the Oakland, Calif.-based writer and activist Alicia Garza posted on Facebook: “Black people, I love you. I love us. We matter. Our lives matter.” Patrisse Cullors, another California writer and artist, shared the post and created the hashtag #BlackLivesMatter. At the same time they organized protests against the Zimmerman verdict, the two women, along with the New York-based community organizer Opal Tometi, quickly built up the Black Lives Matter network on social media. “Many of us were tired and disturbed by the lack of recognition towards the killing of black people by vigilantes and law enforcement,” Ms. Cullors said in a 2017 article in Rolling Stone. Keeanga-Yamahtta Taylor, the author of From #BlackLivesMatter to Black Liberation, told me via email that the hashtag first appeared in 2013, but “the movement was born in the streets of Ferguson in August of 2014”—referring to the St. Louis suburb in Missouri where, in response to the shooting death of 18-year-old Michael Brown by a white police officer, Black Lives Matter held its first national protest. The movement has grown to include chapters in Australia, Britain, Canada and Ghana. Its members have met with political leaders like Hillary Clinton and Bernie Sanders to discuss issues like police brutality and institutional racism. B.L.M. has also spurred activism on campuses across the United States, including the protests against racism at the University of Missouri in 2015. In that same year, B.L.M. launched Campaign Zero, which provides organizers with a list of proposals aimed at combating police violence, including the curtailment of “broken windows” policing, independent investigations into local police departments and increased racial diversity among U.S. police officers. The movement also guides its local chapters with goals and principles that emphasize restorative justice, empathy, being queer- and transgender-affirming, and fighting “vigorously for [the] freedom and justice for Black people and, by extension, all people.” By using both social media and direct action, the movement has grown—and is not without critics. Since the creation of #BlackLivesMatter, Catholic leaders have begun to take the racial justice movement much more seriously. What can the Catholic Church learn from #BlackLivesMatter? 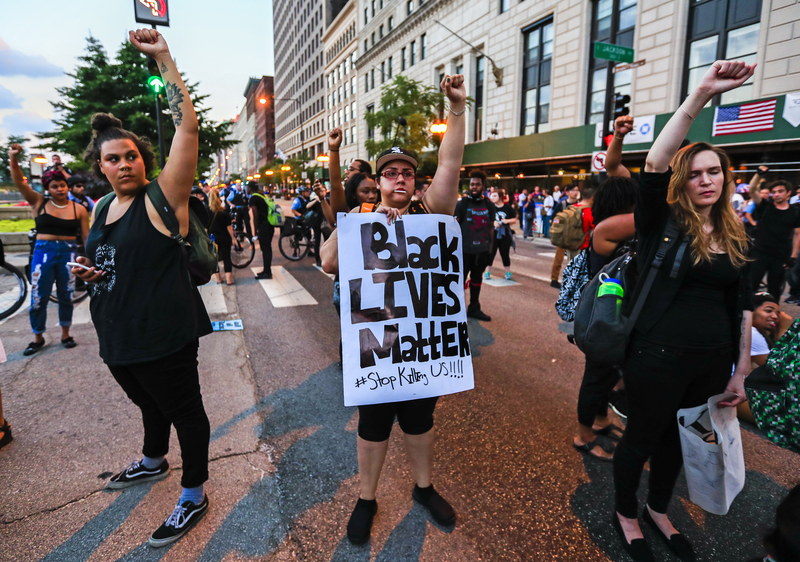 The momentum of Black Lives Matter may have also been a factor in the United States Conference of Catholic Bishops establishing a new Ad Hoc Committee Against Racism last August. The goal of the committee is to address “the sin of racism in our society” and its effects on both the church and civil institutions. The bishops will release a pastoral letter based on the committee’s findings this November—the first formal document from the U.S.C.C.B. to address racism directly since 1979. These efforts are welcome. But we are also seeing a rise in reported instances of racial bigotry in the United States, from citizens calling the police on African-Americans going about their daily lives to the rise of white supremacist groups to the Trump administration’s treatment of immigrants at our borders. Now more than ever, we need the Black Lives Matter movement. We must continue to reaffirm that black and brown lives matter. The Catholic Church proclaims that “human life is sacred” and that as we live “in a society marred by deepening divisions,” we must put the needs of the marginalized first. If we are to truly embody Jesus Christ and care for all human life, then we must explicitly stand with our brothers and sisters marching and chanting that Black Lives Matter. We must not let the onus lie solely on the backs of women and men of color. We must lift them up and carry them because the principles this movement embodies—to live in solidarity, to effect restorative justice and to bring about loving engagement—are exactly what we are called to do as Christians. This means embracing a lie. Blacks have a very difficult time in the United States but it has nothing to do with targeting by police (they're not), discrimination or racism. Until the real problems are addressed there will be no solution. The Catholic Church is offering no real help. I think BLM has done some fantastic work but hasn't transitioned well into a more permanent organization. The difference between "activism" and "deep roots organizing" is key. I'm so glad to see this. Of COURSE Catholics should be supporting BLM! It's the most basic of rights to be able to live without worry about being killed because of who you are. These can be dark days and then I see these amazing people creating movements and light and speaking truth to us all out of the darkness. Don't give up! If Black Lives Matter really cared about "black lives" It would not be holding protests for Trayvon Martin and Michael Brown both petty law breakers but would be holding daily marches in Chicago and other big cities where the killing and wounding of blacks is a daily and especially weekend occurrences. Of course when blacks kill blacks it doesn't matter to BLM. The Catholic Church should not be involved at any level with this organization. Trayvon Martin did nothing. He was walking home & was pursued by man with a gun. The police dispatcher told Zimmerman not to pursue Trayvon Martin, but he did & it resulted in Trayvon Martins death. He was not a petty lawbreaker. He was a kid. Suggesr that you research Trayvon's record, covered up by his original school, and he was not just walking straight home either but through a residential area that was not his home. You are correct. What we really need is a New Black Lives Matter movement, an NBLM, that takes a more holistic view of the problem and deals with black-on-black crime, fatherless households and the welfare industrial complex. Yes, it is not police harassment, it is not discrimination, it is not some form of racism that anybody can point to. It is the changes that started in the Depression and accelerated after the poverty programs in the 1960's that led to fatherless households and the breakdown in the family. But that analysis is not allowed on this site. Why? "Last Sunday, a 59-year-old woman on the West Side of Chicago was killed by a would-be carjacker. The felon walked up to the driver’s side of the car, which was being driven by a 71-year-old man, and pulled his gun. The senior citizen refused to surrender the vehicle and kept driving. The would-be carjacker opened fire at the car, striking the woman in the head and killing her. There were no protests against the taking of the carjacking victim’s life." Every editor and author here as well as commenters should read Heather MacDonald before writing anything on Black Lives Matter. Oh. I get it lives of other colors don’t matter. Non sequitur. It does not follow. Gaudeamus sequitur - the church therefore isn’t interested in folks of other colors? “I am black but beautiful ...” means that God’s Word pertains only to Levantines and their black neighbors? Can't follow your manic hyperbole. Black lives matter was to address a cop problem. Cops have been getting more and more twitchy, especially in regards to black people. If you can defend vulnerable blacks from trigger happy police, whites will be automatically protected. We are not black but we are next. Yawn! Black Lives matter is a politically and socially insignificant movement. No one outside of socialist leftist circles cares what they have to say. The movement was based on a lie and is nothing more than an effort to deflect from addressing the inconvenient but real problems that address the black community. Catholics, real Catholics, do not bother with BLM. It is a wayward organization that is nothing more than a vehicle for leftist ideology of class and race warfare. Marxism essentially. America Magazine needs to rediscover authentic, traditional Catholicism again. YES! Thank you for saying this. So many people, including the author apparently, are blind to this. human beings as I thought our Creator was "Colour-Blind". person to emulated by "Black Lives - Matter" ? From Australia I see no reason for any American Christian of any ethnic background to support this political plot to stir up rage amongst the black community against law enforcement who are faced hour after hour by black on black violence and murder. Preach the Good News to these violent, murderous, rebellious racists rather than encourageing them in their sin. In my work with disabled children and adults in various capacities for over twenty -five years (including six years as a Special Education teacher), the great majority of my co-workers were African-Americans, mostly black women. When I worked in the agency's residential department, a significant number of the staff were immigrants from African nations, many from Liberia. At that time Liberia was in the throes of a brutal civil war, and several of my co-workers at the group home with disabled men had fled the war in Liberia, seeking a better life for themselves and their children. I don't pretend that I like all African-Americans. Naturally, as with white people (,I'm white) and people of all different races, I like and respect some, and don't like or respect others. However, I don't believe my views are based on anyone's race or ethnic group. I don't believe I harbor prejudice towards blacks. In fact, I certainly sympathize with immigrants regardless of their race who have come to our nation to escape war in their homelands. I do believe that there is some anti-immigrant sentiment based on largely unfounded claims that immigrants are typically criminals. I also agree that there have been numerous incidents in recent years of prejudice towards African-Americans in their daily lives. I live in suburban Philadelphia, and several months ago there was an incident in a city Starbucks in which several black patrons were asked to leave and the police were called and arrived because they had not made a purchase. The men were arrested, handcuffed, but weren't charged with any crime (as I refall). The CEO of Starbucks rightly in my view publicly apologized for the "unique" treatment of the black patrons that wasn't applied to white patrons. I also believe that there have been tragic cases of African-Americans being targeted and shot and wounded or killed because of their race. To a large degree, the "Black Lives Matter" movement makes a valid and important point about racism. However, and it's a cliche but I think nonetheless true that since the Church teaches that all human life is sacred, that all human lives regardless of race is sacred. I believe we must also keep in mind that despite the unjust acts of some police officers, that the great majority are doing their difficult, often dangerous duties to protect and serve the public. I recognize that this will cause some controversy. I believe that there's good evidence that children raised in families of any race that lack a father fairly frequently grow up facing more challenges than those children raised in two-parent families. I believe the negative effects of a family lacking a father include children being less likely to do well in school, and being more likely to use illegal drugs. The fact is that while many children who are white or Hispanic grow up in homes without a father present, unfortunately the great majority of black families have no father present. I agree that our bishops should make necessary statements against racism in the Church and society, and make efforts to encourage inclusion and greater participation among African-Americans in the Church and in our nation's life. However, I believe that our bishops must encourage marriage so that any children born are raised in a (hopefully) loving, emotionally healthy family environment. Sages say life without a mission is no life. Mission adds life to our life-span. Does Fr. Martin ever talk about The Kingdom of Heaven and eternal salvation through Jesus in the Holy Trinity? This article also appeared in print, under the headline "Catholics must continue to embrace the mission of #BlackLivesMatter," in the August 6, 2018 issue.